I did these nails probably 10ish days ago.. I know, I finally have some manis stock piled so I actually have blog posts lined up - yay! I know I saw a photo with nails like this somewhere on tumblr.. Yet I had decided to do something else. Then, when I got to my little painting station, I flip-flopped and decided on this instead! Actually, now that I'm looking at these bad boys again, they are almost Easter-esque.. Why do I always do Holiday/Seasonal looks during the wrong season? Meh. Hope everyone is having a great day! I think I might have to make a post tomorrow about some goodies that have arrived for me recently.. Yeah, tomorrow it is! 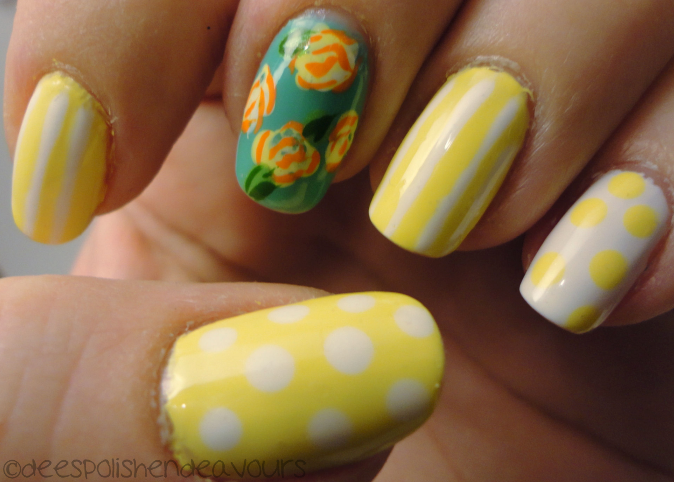 I'm impressed with how you mixed the delicate designs with bold bright colors! One more time -really cute! hey you have an awesome blog !! @ Irishenchantment - Thank you!! @ lucyclark - I Think you should recreate them! I would love to see that!! @ Freshie - Thanks, at first I HATED it, but went to bed as it was late and I was overly tired. Work up and love them! @ Super Cute Super Easy - You really should! I didn't really think these looked too rose-like, but everyone immediately knew what they were! It is worth a try no matter what!! @ Suzie Makes You Up - Thank you, glad you like it! I will also check out your giveaway, thanks!